The Veterans Gardening Guide was written to honour our brave and courageous veterans in Canada and the United States. These are the men and women who have served their respective country in times of war and during peacekeeping missions. Veterans deserve the greatest respect and honour for their many contributions. Being around nature has a calming influence and is conducive to an individual’s overall positive attitude. Everyday stresses seem to dissipate as a person immerses themselves within a natural environment. Parks and gardens foster an appreciation for nature and instill a sense of purpose and responsibility to be a part of maintaining the fragile environmental balance. Research proves that gardening is good for a person’s health. It encourages us to get out in the fresh air and sunshine and to get moving. It is a low-impact exercise that young or older people, those with a disability or suffer from chronic pain can benefit from. 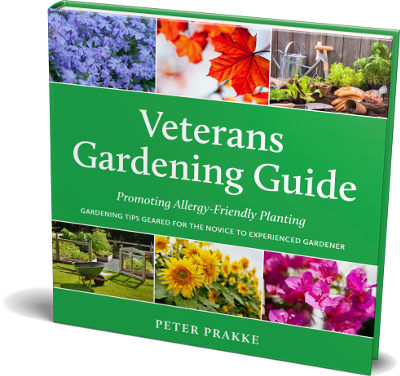 The Veterans Gardening Guide offers a wealth of information for new and experienced gardeners with a focus on allergy-friendly plants. For those with allergies and asthma being around high allergen plants, can cause serious respiratory problems. Using the Ogren Plant Allergy Scale (OPALS®) created by Thomas Ogren, horticulturalist and allergy researcher, the guide lists plant selections along with their OPALS ranking for their potential to cause allergy and asthma reactions. 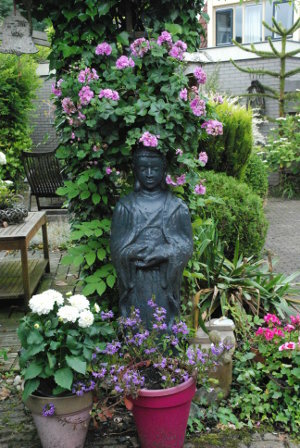 Throughout the Guide, I encourage all gardeners to create a healthy balance with their plant choices. … Plus a special chapter on Honouring Veterans, including information on how to create a Bravery Park for your town or city. The Veterans Gardening Guide is a great resource tool for any gardener! A key thing that I find is that trees and humans share many characteristics that we know about and still have to learn. We know trees do not heal as humans do. Where if you have a cut it usually is restored to pre-injury condition, maybe with a scar but generally as before. As trees are injured, all they can do is focus energy to isolate the wound by covering it over or putting in barriers. Therefore, if the bark of a tree is injured, by say a scuff mark by a piece of lawn equipment when the tree is 15 years old, it will be a blemish or small decay area in the trunk of the tree for its entire life. When the tree is cut down the injury would be visible in the growth rings. – Peter Wynnyczuk, P&A Urban Forestry Consulting Ltd.
© 2019 Veterans Gardening Guide. All Rights Reserved.